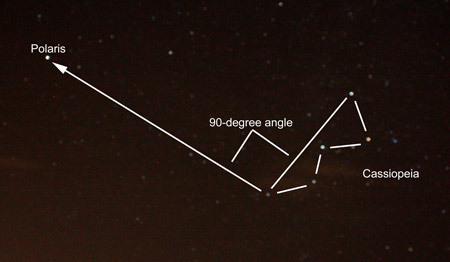 Like Polaris, the constellation Cassiopeia is a northern star grouping, circumpolar above latitude 35 degrees North. This constellation is said to represent a beautiful, reclining woman. That may be so, but it would take quite an imagination to come up with that idea out of these five stars. 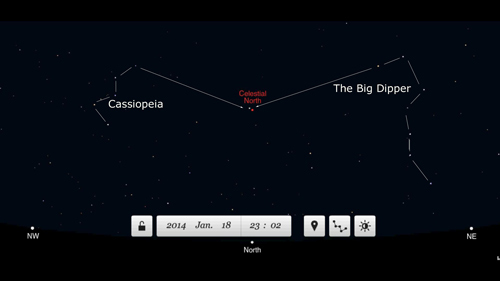 While I can easily see a Big Dipper in that star grouping, when I look at Cassiopeia, all I see is a huge M-shape, which reminds me of that famous fast-food place well known for selling billions of hamburgers. My appetite works overtime when I'm in the wilderness, so naturally my mind tends to go more in the direction of cheeseburgers than in anything to do with the long-ago antics of mythological characters. The truth is, as a navigator, I'm primarily interested in direction. As long as I can use the stars to find direction, anything to do with ancient mythology is of interest mainly in so far as it helps me understand star patterns. Cassiopeia, like the Big Dipper is found in the northern sky, circling the pole star, and is located on the opposite side of Polaris from the Big Dipper. In those latitudes where the Dipper sets (below 41 degrees North), Cassiopeia becomes an especially important constellation because she can help you find Polaris when the Dipper is under the horizon. To find Polaris by Cassiopeia, first notice that one hump of the M-shaped, five-star constellation is flatter than the other. Having identified the flatter hump--the constellation's "lazy side" as it's sometimes called--imagine a straight line beginning at the outside star located at the base of the M's more pronounced hump, and ending at the outside star located at the base of the M's flatter hump. Now, imagine a second line beginning at the end of the first, and running at a right angle out from the first line in the same direction as the M's underside. Now, imagine that this second line is twice as long as the first. Where this second line ends, you'll find Polaris.